Continuing with the series looking at retrogaming with Linux here is an article showing how to play classic Windows games using PlayOnLinux. (and this process will work with newer games as well). 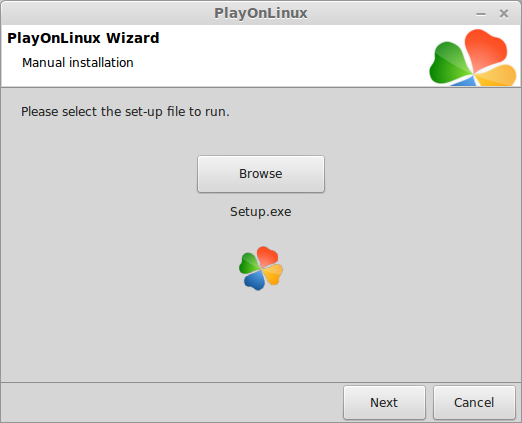 PlayOnLinux is available for most distros and can be installed via the resident graphical package manager such as the Software Centre, Software Manager, Yast or Synaptic. 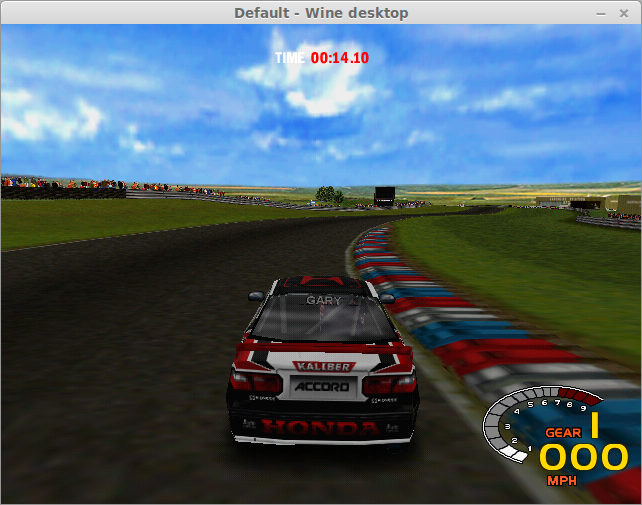 PlayOnLinux provides a nice user interface that makes using WINE and DOSbox easier. This article is going to show how to install a game either from a CD/DVD or from a folder. When you first load PlayOnLinux you will see a list of applications that you have already set up (and if you followed my guide to setting up DOS games within PlayOnLinux then you will have some). To install a Windows game click on the “Install a program” link. The installation screen has a list of categories that you can choose from. If you select the games category a list of games will appear. It is worth checking down the list to see if the game you wish to install is there as it speeds up the process slightly. Note that if you don’t have access to either a CD/DVD or a downloaded program then you won’t be able to install the game. There is a caviat to that because there are games listed via GOG.com which will take you through the process of buying the games and downloading them. For this article we are going to install the game manually. 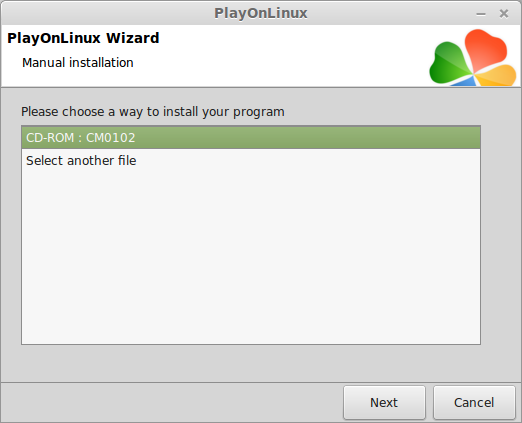 In order to do so click “Install a non-listed program”. A welcome screen will appear but you can just press the Next button to move on. You can now choose to install or update an existing installation. Generally you will want to click the install option but if you get half way through and there is an issue then you will be better off clicking the update as this saves creating another virtual drive. For this guide select the install option and click Next. Enter the name of the application you wish to install. For this tutorial I will be installing “Championship Manager 01/02” which is a classic football management game and probably the best I have ever played. The good news is that you can play it as well because EIDOS who created the game have allowed for it to be downloaded for free. To download the game visit http://www.fmscout.com/a-championship-manager-0102-free-download.html. The game will be downloaded as an ISO. After downloading the ISO you can either burn it to a CD using Brasero and insert it into the drive or you can mount the ISO as if it is a CD. Of course if you have another game that you want to install insert the CD into the drive. 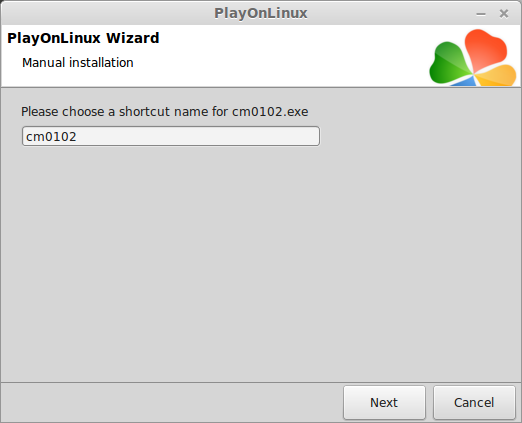 Click Next within the PlayOnLinux Wizard after entering the name of the game. 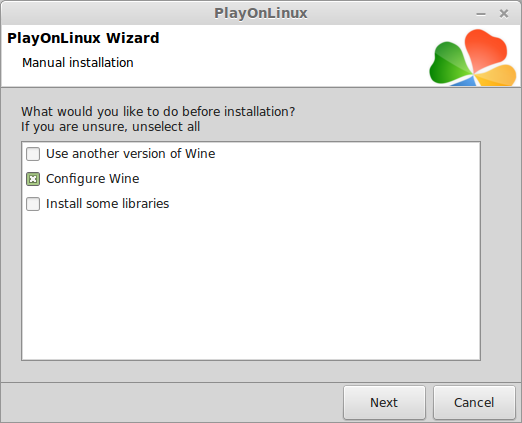 You now have the opportunity to choose the version of WINE to be used, configure WINE or install extra libraries. 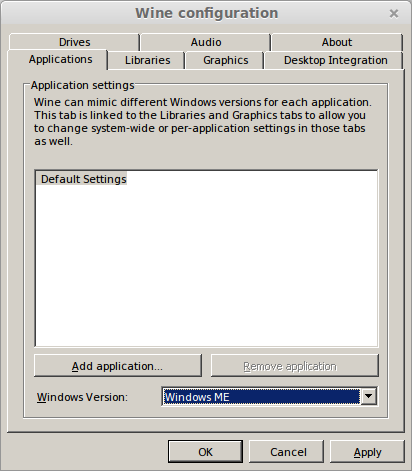 If your game is pre-2001/2002 then it is possible that it was made for Windows ME or before and it may not work with Windows XP which is the default machine type for PlayOnLinux. 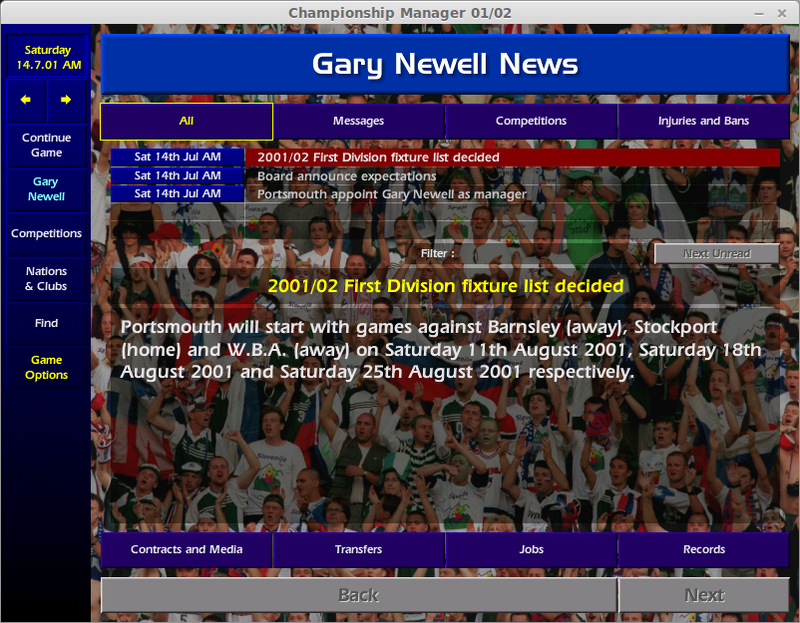 Championship Manager was built for Windows 98/ME and therefore the configure WINE checkbox needs to be checked. Before you can configure WINE you have to choose whether you are installing a 32-bit or 64-bit application. All older games will be 32-bit but some modern games might be 64-bit. For Championship Manager it is definitely 32-bit. Click Next to continue. The WINE configuration utility will now load. From the Applications tab change the Windows version to something prior to Windows XP. Windows ME was a truly awful operating system but Championship Manager runs using it. This is the point where you choose where to install from. You can either choose the CD/DVD or you can select another file. The select another file option lets you choose from files stored elsewhere on your computer. For Championship Manager I mounted the CD-ROM (I actually own the original disk but I am writing this guide as if I downloaded it as I know most people won’t have the disk). Select the CD-ROM and click Next. 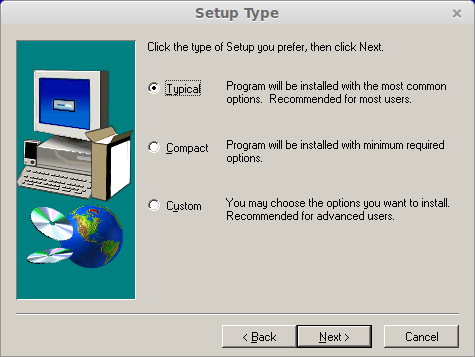 After choosing the CD-Rom you will be required to choose the setup file in order to install the application. Click the “Browse” button and navigate to the /cdrom folder on your computer and choose “Setup.exe”. Click Next. The game’s installer should now kick in. Each game will have its own installer and generally it is the case of installing the same options as if you were installing it on Windows. 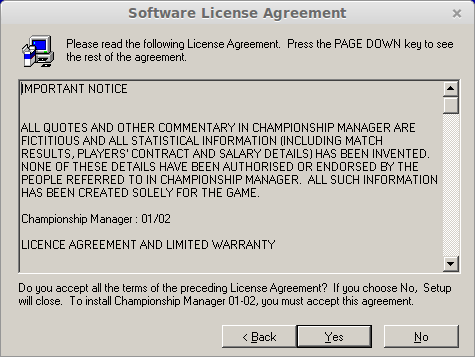 The setup for Championship Manager requires you to choose your installation language, accept the agreement, choose a destination folder, determine how many of the files to copy from the CD and select a program folder. The game will be now be installed. An important part of the installation is when it asks whether you want to install DirectX. The answer to that question is pretty much always no. WINE already has DirectX catered for. 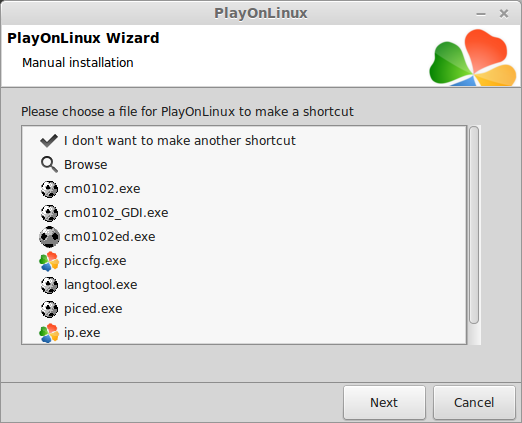 After the installation has finished you will be asked to choose which program to create a shortcut for within PlayOnLinux. 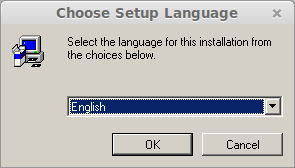 Choose the correct program and click Next. For Championship Manager select the cm0102.exe file. Note that this will create a shortcut on your desktop. If you would prefer not to have a shortcut click the “I don’t want to make a shortcut” option. Finally enter the name of the shortcut that will appear on your desktop. That is it. 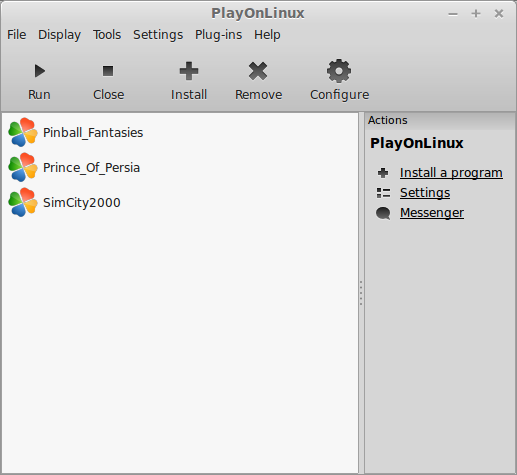 You can run the game either from within PlayOnLinux or from the shortcut on the desktop. Some games from prehistoric times required 256 colours and no more. There are ways to do this in Linux but it requires changing the XORG.conf file and restarting X which isn’t ideal. A workaround to this is to create a virtual machine and install a very basic version of Linux on it and then install PlayOnLinux and the game within the virtual machine. You can then set the number of colours for the virtual machine to 256 colours. Windows users might be smugly thinking that this is a lot of hassle to play a game but running DOS games and older Windows games is a nightmare using Windows 8 (virtually impossible in some cases). 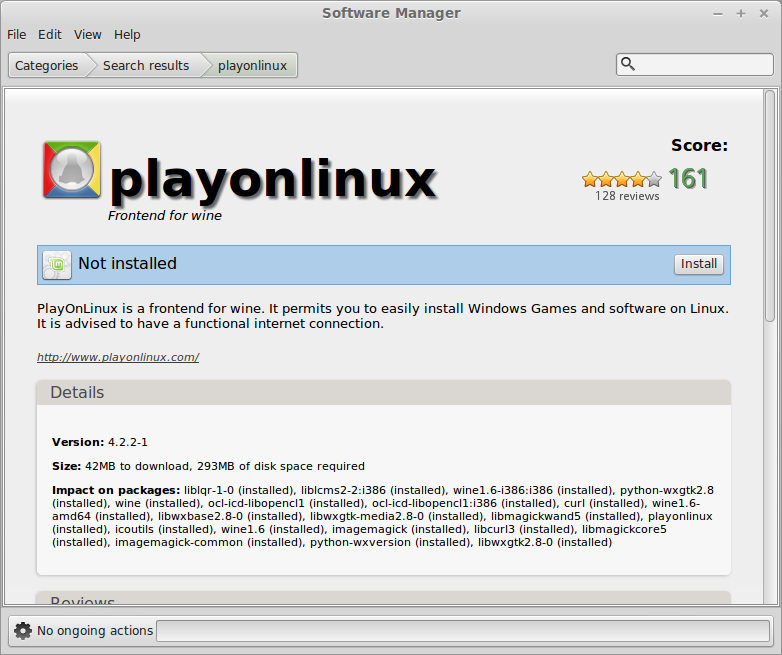 PlayOnLinux and WINE are great for playing games within Linux and although Steam and GOG.com have done a great deal in trying to bring native games to Linux there will always be a place for WINE. Really awesome tips and techniques to play classic game. Thanks for sharing. Now game lover can enjoy the ultimate gaming experience like never before.